This flask makes for a small and inexpensive gift for someone special. It contains holy water from the river Jordan. The flask is decorated with a holy cross and can be kept nearby as a source of inspiration and gratitude for all that life has given us. A gift from the holy land, however small, can mean the world to someone special. By keeping this close and guarding it, one may draw the necessary fortitude and strength required to face any challenge. 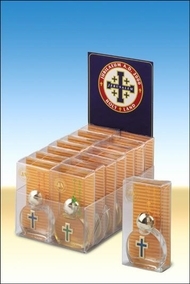 Purchase this item as a way of coming closer to the holy spirit, thus making a wonderful Christian gift.